Alison Goldfrapp and Will Gregory have gone for a full-on synth sound on this, which has doubtless led to accusations that they're jumping on the electroclash bandwagon. 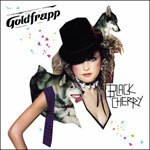 That may have more than a ring of truth about it, but it's unfair, simply because Goldfrapp do it so brilliantly. This is no monotone, identikit electroclash record, the band seems to have drawn elements from such diverse acts as Curve and Donna Summer and absolutely everyone between them. 'Train' is a driving track with a glam rock style riff, while the title track is a slow seductive piece. 'Deep honey' is a slice of almost 4AD-style ethereal atmospherics, as is 'Hairy trees', though with a hint of '60s pop. These contrast strongly with the raw Curve-esque grind of 'Twist', the pure disco groove of 'Strict Machine' and the dark, almost EBM vibe of closer 'Slippage', featuring Portishead's Adrian Uttley on guitar and bass. Over all the music, though, it's Alison's voice that makes it - she purrs, hums and, well, sings in the sexiest tones imaginable. It really does have to be heard to be believed. Goldfrapp have the style and talent to go beyond simple trends and genre divisions and are likely to still be around when electroclash fades.